Peter Dinklage and Sacha Gervasi first announced plans to make My Dinner with Herve back in 2012 when it was revealed that they were writing a script. And now, HBO has released the first footage from the upcoming movie which premieres on Saturday, October 20th. Peter Dinklage plays Herve Villechaize, who was once known as the most famous dwarf in the world. Villechaize was a French actor who starred in Fantasy Island as Tattoo and in The Man With the Golden Gun as Nick Nack. My Dinner with Herve takes place over one night in Los Angeles when Peter Dinklage's Hervé Villechaize is interviewed by struggling journalist Danny Tate, who is played in the film by Jamie Dornan. The movie is based off of an interview that director Sacha Gervasi conducted with Villechaize, which was the last interview that the late actor agreed to. Villechaize committed suicide shortly after his interview with Gervasi in 1993 and many believe that the interview was a suicide note from Villechaize. Sacha Gervasi has gone to great lengths over the years to declare that Herve Villechaize was much more than a pop culture icon from the 1970s and 80s. The director has said that Villechaize was "one of the most charming, cultured, and dangerous people I've ever met." My Dinner with Herve is going to explore the depths of the man behind Tattoo and Nick Nack and try to put forth who he was in real-life. 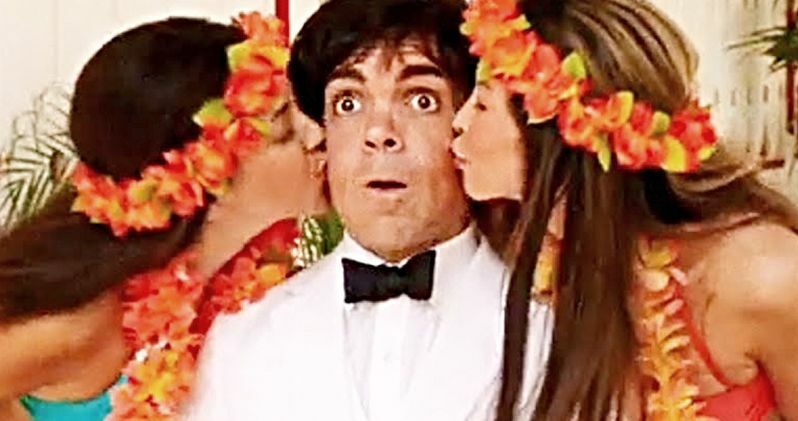 Peter Dinklage doesn't exactly look anything like Villechaize, but he has the acting chops to bring forth an excellent tribute to the late actor, which is evident in the 30-second teaser that HBO has just released. In addition to Peter Dinklage and Jamie Dornan, My Dinner with Herve also stars Mireille Enos as Herve's longtime girlfriend, Kathy Self, Harriet Walter, Fiona Baskin, Oona Chaplin, Katie Nielson, David Strathairn, Marty Rothstein, and Andy Garcia as Ricardo Montalban, Villechaize's Fantasy Island co-star. In addition to directing the film, Sacha Gervasi also co-wrote the screenplay with Sean Macaulay. Dinklage also serves as a producer on the project along with Gervasi and Garrett Basch and David Ginsberg. As previously noted, My Dinner with Herve has been in development for years. HBO is preparing to debut the movie on October 20th, so fans will finally get to see what Peter Dinklage and Sacha Gervasi have been working on for so long. The teaser video for the film packs a lot into 30 seconds and teases Herve Villechaize's "real story," through clips of the actor on Fantasy Island and The Man With the Golden Gun, as Villechaize is at the top of his game and then at the end of his life as he sits down for his interview with Danny Tate. You can watch the first footage for My Dinner with Herve below, thanks to the HBO YouTube channel.